And here is the inevitable bugfix release. But this time, we’ve even added new features! Just type “1d10” to throw a D10 and get the result. This works like the other dice rolls, just without the target value. The skill names in the DH2 (Paper) Sheet Template are quite “hard-coded”, which means you cannot add your own skills in the template except for Lores and Trades. In the 1.3.x version, we try to stick to the original template wherever possible, which unfortunately removes the ability to add custom skills in the pdf export (they are of course shown in the app itself). In the 1.3.0 version, custom skill names broke the pdf export, which has been fixed in 1.3.1. We might change the skill creation in the future to allow the export of all skills, but for now, if you want to be on the save side, use the search function to add new skills. 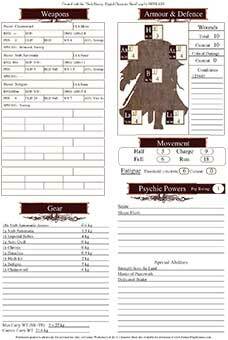 These skills will have the right name format to be displayed in the PDF. Perhaps an example is easier to understand: If you name your Skill “FL: Underworld”, it won’t be shown on the PDF export, because the app does not know what FL stands for. If you stick to our naming conventions and name the skill “Forbidden Lore (Underworld)” or “Forbidden Lore: Underworld “, it will be shown at the right spot in the PDF. 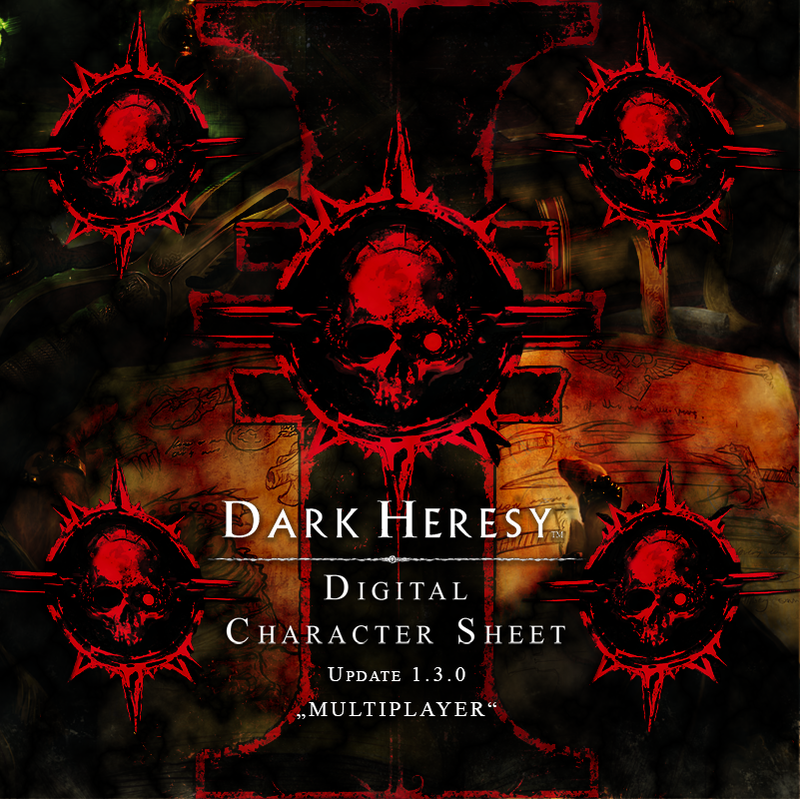 Dark Heresy Digital Character Sheet App 1.3.0 released! 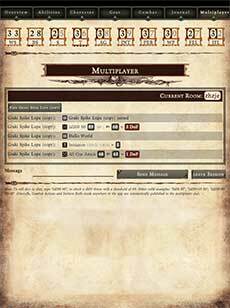 Today, we have released the new free content update for the Dark Heresy Digital Character Sheet App called “Multiplayer“. In this update, we added two very important features: multiplayer and printable character sheets! Details about each change can be found in our update reveal post. The new update will be automatically downloaded to your app if your device is connected to the internet (download size 10mb). You don‘t have to wait for the update to go live on the app stores. Once the download is complete, the app will restart and you should see the new additions immediately. If you want to be sure, check the version at the bottom of the overview tab, it should read version 1.3.0. We will gather feedback and release a bugfix patch when necessary (we highly doubt we found all bugs in such a big update…). If you find a bug, please report it via mail to support@dizelabs.com and please include the character file of your active character when the bug happened. First of all, sorry about the “radio silence”, we were working day and night to finish the release (besides other problems which we needed to solve first). In the beginning, we tried to provide a new app version around every three weeks. This time, it took a bit longer. After we were done coding all the features and fixing bugs on August 29th, we started our final tests. In this stage, we are copying the app on all of our test devices and start testing the new features. Normally, nothing goes wrong in this stage, because we also use a small subset of these devices in our development stage. We were quite shocked to see that all iOS devices and a few android devices crashed on the PDF generation with a “Memory Error”. For the technical people: Let’s take an iPad for example. Any app on it is allowed to use 500mb RAM. If the app goes beyond this limit, the app closes instantly without any error message. This happened every time we tried to generate a character sheet PDF file. Eventually, we scrapped the whole PDF generation and started over with a new approach. 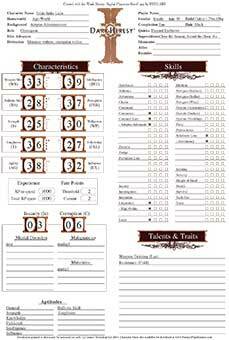 After a week with very little sleep and over 400 generated pdfs, the new sheet was done, works great, looks almost exactly like the FFG Character Sheet (except for the background, which is white on our sheet). With the PDF Generator done, the new version is finally complete and, after a last round of tests and the usual approval process, will be pushed to the server. To be on the safe side, I expect the update to go live on monday, but maybe we will get it live faster. Play with your friends! The multiplayer allows you to create rooms for you and your friends, where each dice roll made in the app, every initiative roll and every combat action is shared with all characters in the room. You can view the character sheets of your friends and the inquisitor can add multiplayer characters to the warband. The most requested feature is finally in the app. Create a pdf file from any of your characters by clicking the “create PDF sheet” button in the character backup popup (due to technical limitations, only the currently active character can be exported to pdf, so please activate the character you like to export first). The PDF File will be stored in the same folder as the character backup files and can be viewed and printed by any pdf viewer. It is now possible to create backups of your character in the cloud. It works like the offline backup, but it is in the cloud! 🙂 It should work even if you delete the app from your device and later install it again. There is a new button in the footer of the overview tab. It enables/disables the power save functionality of your device (only for DHDCS), which means the screen will not darken after a few minutes. Ever wondered what you can do during a fight? All Combat Actions from the source book are now in the combat tab, easily accessible via the search function and including a description. If the action involves rolling dice, the app automatically shows this option. It also includes any dice modifiers made for example by aiming (even half and full round aim) and all out attacks. Duplicate Aptitudes and negative Experience Points are now shown in bright red to help you spot these sheet errors. In the very near future (next week), we will open a youtube channel with tutorial videos on how to handle the app as well as feature overviews and more. With the new release, we think that the Dark Heresy 2nd Edition App is in a good state for the moment. It is quite possible that we will release a bugfix patch or two next, depending on the stability of the multiplayer. Our next project, the Dark Heresy 1st Edition App, is already in the making and will be out quite soon. The next big content update for the 2nd Edition is planned with the release of the “Enemies Without” supplement.